Forty-eight artists from over 18 countries are gathering at LACDA via the Live@808 networked performance space. Live@808 is a custom web application where realtime video, audio, texting and countless other media collide and intermix in a playful and exciting environment facilitated by emergent technology. The live webcams and video feeds projected in the gallery will be accompanied by a multi-screen installation of video shorts looping on monitors throughout the space. The FEED_BACK exhibit is a zone of participation, input, response, and transformation that beckons us toward openness, spontenaity and improvisation. It is an inter-media experiment in collaborative international connection and communication that engenders an awareness of the cogent ability of internet technologies to galvanize the world culture in a constructive manner. 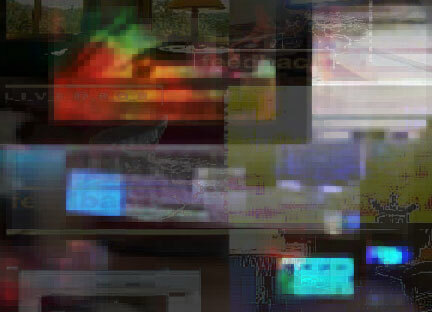 All views simultaneously in equal amplitudes illuminate the newly mediated grid of the social. A high bandwidth sense of being unfurls where all notions of anything or everything collaborate and communicate instantaneously over a reverberant labyrinth of wide area networks. This is discursive critical mass—no opinion can exist at the expense of another and all identities, genders, skins, species, preferences and desires are transmutable. The didactic dissolves and philosophy is aesthetisized as infinitely malleable and interactive audio-visual spaces. Anteriorly recursive plagarisms download, mutate, intermix and upload again. Vocabulary becomes a poetics of redefinition, and concepts become the vertigo of a shimmering ideological spectrum moving at light speed. This is the new music of the technologized psyche: the electronic symphony of every instrument and every note synchronously blended to one monolithic and ecstatic tone. A meditation. An intercultural over-excitation where all colors combine to create a brilliant light. Each computer screen is a glimpse, a partitioned selection of this luminous digital site, of the total epistemic memory residing in the global database for instant retrieval, update, recombination and re-storage. This vortical workstation of the internet is a tributary, a feeding bottle or breast, and an hermaphroditic genital of the info-communicative circulatory/nervous system where through interaction we sate the antique dictum for being the smarter monkey that better survives a hostile nature, that better survives its own hostile nature. And then, noise becomes the signal. Find the signal in the noise. Overexposed, overloaded, distorted, meters in the red. Hissing, scratched, discolored, alaised, unintelligble and unreadable. Lens flares. Warped, faded, clipping, bleeding, and humming. Dot screens, moiree patterns. Raster lines. Corrupted data. Feedback. Modem hash. Channel offsets. Degenerated dubs, replications and simulations. Allow random access thoughts. Art is assembly language. Be a noise-to-signal processor. Processing and filtering all input. Be electronic. Sampling, capturing. Reconfiguring. Inputting, communicating, disseminating. Be a feedback loop. Be an answering machine. Be a disconnected number, out of service. Be a busy signal, unreachable. Be a signal. Be a system error, crash applications. Be an error message. Be an error. Be an assembly language translator. Be machine level code. Be code. Be corrupted streaming data. Be an aliased side effect. Be aliased.